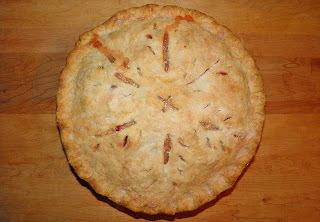 There's nothing quite as delicious as strawberry-rhubarb pie. That sounds particularly unappetizing, but here’s something that is. 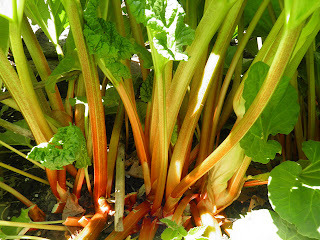 Nova Scotia rhubarb is now for sale in the local markets and probably the groceries (but I can’t verify that for sure). I was lucky and got mine for free. I was recently visiting some friends whose patch has come to “fruit-ition” already. The timing may be a week or so earlier than other years, but I’ll deal with it. I was more than happy to avail myself of the tart, delicious stalks. 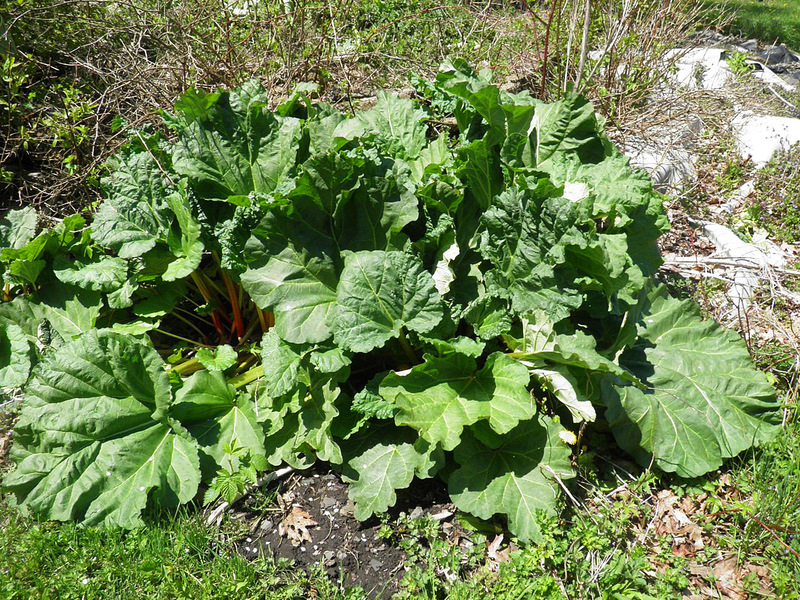 Oddly enough, my own rhubarb patch looks like it’s about 2 weeks behind theirs. I guess that’s the difference between full sun and not so full sun. Mine’s the latter case. Rhubarb is one of the first “local grown” crops to come onto market every spring and is beloved (or reviled) by many. Let’s face it – rhubarb is tart. Some love it, some don’t. 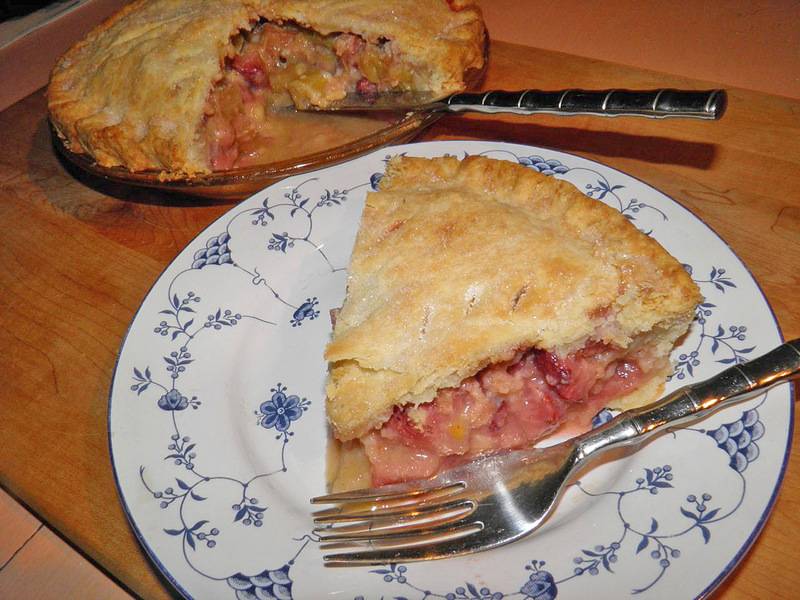 A favourite way to enjoy rhubarb is to therefore combine it with other fruits that are sweeter. Although there are many that could be chosen, the most common pairing is strawberries. This is even though local strawberries don’t become available until the last week of June. Thank goodness for imports (I guess). That’s what I used to make this pie. There is an alternate way: preserve your rhubarb until the fresh, local berries become available. This is good advice anyway, because there’s no such thing as growing “a little rhubarb.” You always seem to have too much. So how do you preserve rhubarb? I find the best way is to chop fresh stalks into 1” pieces. This is the size you would use for a pie filling and many other recipes. Then simply blanch the pieces in boiling water for about 1-1/2 to 2 minutes – with no salt. Then simply drain, bag and freeze. 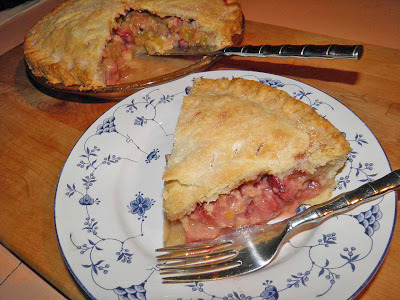 If you deal with your over abundance of rhubarb in this way you can have the next best thing to fresh any time of the year! For those who don’t know, here’s some important information. Rhubarb leaves contain oxalic acid which is poisonous. You would have to eat quite a lot of the leaves to die (about 5kg), but even a little will give you quite an upset well before that level is reached. The stalks also have some oxalic acid, but far less than the leaves. So never eat rhubarb leaves. By the way, I pride myself on my pie crust. Sometimes I have a dud, but most times it’s flaky and pretty good (if I do say so myself). The secret is to just bring the dough together and not maul it until it's smooth. Rough dough is flaky dough. I learned from my dad, who was impatient in making his crust. It always came out well. This crust was better than most. The addition of the egg and vinegar may have had something to do with it, but I mostly blame it on using lard, as opposed to shortening. You can substitute vegetable shortening if you must… but try the lard. cut it later. See recipe for a hint. 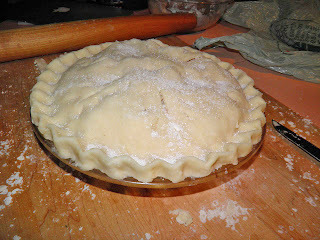 Make the crust by cutting the lard into the flour/sugar/salt until the size of small peas. Mix together the vinegar, egg and water. Stir into the dough until just combined. Combine eggs, sugar flour, salt, cinnamon and lemon rind and mix well. Chop and toss the rhubarb and strawberries together. Line a 9” pie plate with half of the rolled pastry. Do not trim the edges. Fill with the cut fruit. Pour egg mixture over the top. Bake in a preheated 400°F oven for between 40-50 minutes. Let cool slightly before serving to allow the filling to set. Vanilla ice cream goes very well with a slice. * HINT: I cut six vents in the top of this pie. I found it very easy to cut along the vents to serve and the crust didn't break apart or collapse. Six vents equaled six slices. If you wish, cut 8 vents and divide the pie into that many pieces. This is a trick I will be using a lot in the future!